Griffin Bay Bookstore kicks off activities for kids and adults on Saturday, April 27 to begin celebrating 40 years of bookselling in Friday Harbor. There’s no better way to celebrate Independent Bookstore Day than to visit an island institution: Griffin Bay Bookstore. Parents and kids: Make sure to come to the bookstore to find out how to win prizes for artwork—gift certificates for drawing a picture of your favorite book, character, or scene. Submit your drawing to be eligible for one of three prizes for three different age groups: six and younger, seven to twelve, and thirteen to eighteen. A total of 9 gift certificates will be given out and winners will receive a $25, $15, or $10 gift certificate. Submitted drawings will festoon the café until the end of the year. Sign up on Saturday the 27th and learn more about the contest. You’ll have a month to create artwork with a literary theme. Deadline for submitting your drawing is May 27. Winners will be announced shortly after. For adults—it’s Book & a Cuppa on Saturday. Get a free cup of coffee or tea after buying your book on sale! Griffin Bay Bookstore was opened in 1979 by the first owner, Chris Schmidt, but she quickly sold it to its second owner, Susan Eyerly, who ran it for 26 years until her death in 2006. Laura Norris, Susan’s good friend, took over that same year, and moved Griffin Bay Bookstore from its tiny nook on First Street into its current location on Spring Street soon thereafter. Thanks to our loyal customers the bookstore is still welcoming and busy. Our shelves are full, the inventory of books carefully curated. The store also offers a gamut of literary-minded, educational, and gift items to choose from. There’s no doubt that the bookstore has become favorite place for browsing, meeting friends for coffee and talking about books! 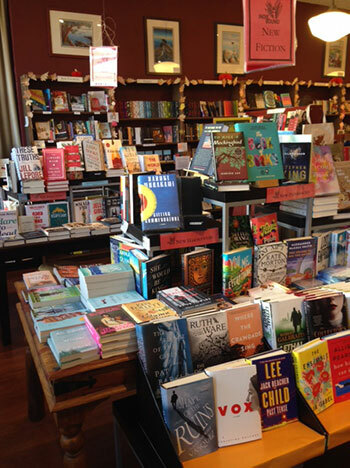 Independent Bookstore Day April 27, 2019 is a nation-wide day that showcases the value of an independent bookstore in a community; all across the country indies are celebrating the incalculable role their bookstores play in the cultural, intellectual, and economic lives in their communities. Independent bookstores are beloved for not just connecting readers to books, but also to one another. Griffin Bay Bookstore’s success, our place in the island community is a result of hard work, careful planning, and dedication to literature, dedication to promoting literacy and great reading—all made possible with a friendly and cheerful staff of well-read and well-versed bibliophiles, each with a particular area of expertise. Our customers have rewarded us with on-going support, offered book suggestions, raved about our collection, placed orders for books with us rather than from an online retailer. They have demonstrated that they understand the importance of partnership and have let us know that they want to be able to stop in their bookstore regularly, to have the fun of discovering new books, new authors, to chat with staff about the latest book reviews they’ve heard or read. What could be more local? From April 27 until the end of the year, Griffin Bay Bookstore will celebrate 40 years of bookselling with lots of hoopla. Keep on the lookout every month for special events and fun activities and 40th anniversary merch. Come and join in to help us pay tribute to the written word, the rich and vibrant literary culture in the islands, in the PNW, and across the country. We want you—readers, writers, customers—to be a part of the fun, the excitement, the enthusiasm of our 40th anniversary party!